CW: Dr Menton, I understand that in the past few years you’ve become interested in scales, feathers and theories of bird evolution? DM: Yes. Some years ago I picked up a wild bird feather. 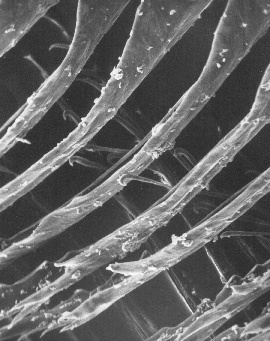 My area of research deals largely with the skin and, of course, feathers grow from the skin, so I thought it would be appropriate to take a peek under the scanning electron microscope, which stimulated my interest in feathers. Of course, evolutionists have long argued that feathers evolved from reptile scales and are thus fundamentally the same structure—very similar. Yes—so I became interested in comparing them myself. I had a laboratory technician at the time who had a ‘pet’ boa constrictor, so I took a look at some of its scales from shed skin. I was amused that they were, of course, not even the slightest bit similar to feathers, as these photographs show [see below]. The only similarity is that they are both made of the protein keratin—like hair, nails and our skin. 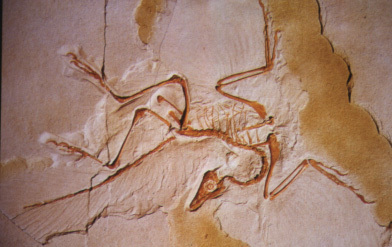 Evolutionists sometimes claim that the fossil creature Archaeopteryx is the link between reptiles and birds. In Eichstätt, Germany, in 1984 there was a major meeting of scientists who specialize in bird evolution, the International Archaeopteryx Conference. They disagreed on just about anything that was covered there on this creature, but there was very broad agreement on the belief that Archaeopteryx was a true bird. Only a tiny minority thought that it was actually one of the small, lightly built coelurosaurian dinosaurs [small lightly framed dinosaurs]. Did that mean that really they didn’t think it was a transitional pre-bird? Well, it’s kind of interesting that they found it necessary to draft the following statement. ‘Conferees did agree unanimously to the declaration that organic evolution is a fundamental process of biology and we recognize the importance of the Archaeopteryx contribution to that problem.’ So you can see they were acutely aware that their deliberations might lead some to wonder whether, in fact, Archaeopteryx had anything to say about evolution, so they all did sign this. If, of course, it’s a true bird, it is not the half-way, half-reptile, half-bird like we’ve often heard. 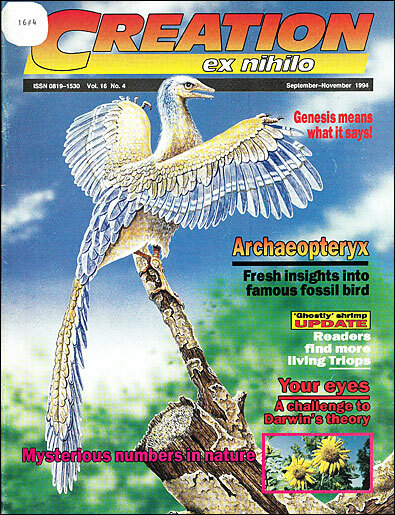 Dr Menton, the first issue of our magazine had an article about Archaeopteryx, which I wrote. At that time everyone was drawing its skull as quite reptilian. I understand that’s changed a bit? Yes. The crushed nature of the skull in one of the specimens may have caused the problem. The general consensus now is that the brain is essentially that of a flying bird, with a large cerebellum and visual cortex. Also, in most vertebrates, including reptiles, the mandible (lower jaw) moves, but in birds (including Archaeopteryx) so does the maxilla (upper jaw). Evolutionists point out that it does have some characteristics which are found in other classes, such as reptiles. This is true, but then it’s true of almost any vertebrate skeleton. There are also design similarities between reptiles, mammals and living birds too. Birds have a distinctive, specialized skeleton because, as one distinguished evolutionist who is also an ornithologist once said, ‘Birds are formed to fly.’ So was Archaeopteryx. Much is made of the fact that Archaeopteryx had teeth. Archaeopteryx was not the only fossil bird to have had grasping teeth. Some fossil birds had teeth, some didn’t. But how can teeth prove a relationship to reptiles, when many reptiles don’t have teeth? Crocodiles are really the only group of reptiles that consistently have very well developed teeth. And of course even some mammals have teeth and some don’t. Some evolutionists have claimed that Archaeopteryx was just a dinosaur plus feathers, in effect. Others have suggested that it’s just a hoax—a dinosaur fossil plus chicken feather imprints. Yes, they have—Sir Fred Hoyle, for example. I find that unconvincing for a variety of reasons. The feathers are not just simply applied to the surface of the bird. Where they are attached to bone by ligaments, we see tiny ‘bumps’. So in Archaeopteryx, the primary and secondary wing feathers are attached to the ‘hand’ and ulna, respectively. And the feathers on the tail are actually minutely attached to each of the 20 vertebrae. There are also a lot of small feathers on the legs and body of this bird, and there is compelling evidence that the head was covered with feathers too. However, when you see pictures of Archaeopteryx or its imaginary ancestors, it’s quite common for artists to show a scaly head. Archaeopteryx has a robust wishbone [furcula]. Some recent fascinating studies using moving X-rays of birds as they fly show how the shoulder girdle has to be flexible to cope with the incredible forces of the power-stroke in flight. You can actually see the wishbone flex with each wing-beat. Do the feet of Archaeopteryx support the view that it was a dinosaur that ran along the ground? No. Archaeopteryx, along with all perching birds, has what is called a grasping hallux, or hind toe, pointing backwards. Rearward-facing toes may be found in some of the dinosaurs but not a true grasping hallux with curved claws for perching. Your pictures below, under the scanning electron microscope, show the tremendous difference between feathers (left) and scales (right) [both magnified 80 times]. But is their development similar? It’s quite different. The most fundamental difference is that the feather grows out of a follicle. A follicle is a tubular down-growth of the epidermis that protrudes deeply into the skin—all the way down to underlying bone in the case of primary feathers. And this tube of specialized living skin produces the feather inside of itself from a growth matrix at the very bottom. The reptilian scale has absolutely nothing to do with follicles. All of the scales can shed as a sheet because they’re nothing but folds in the epidermis, like fabric folded over on itself, whereas feathers would have to come out of their own follicle. ‘Follicles’ brings ‘hair’ to mind. Indeed. The list shown here gives 18 very nontrivial similarities between feathers and hairs. 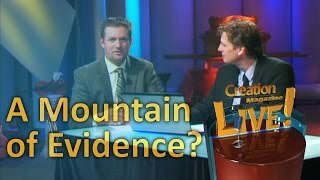 So, if evolutionists really wanted to make a case, they could argue that feathers evolved from hair, or vice versa. Now, of course, that wouldn’t fit the evolutionary belief that mammals and birds evolved independently from reptiles. So hardly anyone gets to know that in fact, it’s hairs, not scales, that are similar to feathers. How do evolutionists believe birds evolved flight? There are really two theories—you can’t test either, of course. The arboreal theory says that they started up in the trees, and flew down, and so scales are viewed as having grown longer and longer somehow to promote gliding. The cursorial theory postulates that the birds really started on the ground and after vigorous hopping and what-have-you managed to eventually fly up. Each side is quite certain the other side is dead wrong, of course. Evolutionist John Ostrom speculates that feathers evolved from large scales on the forelimbs of dinosaurs and that these long feathers, as they developed, were used to catch insects! Now, while feathers are remarkably strong for their weight, I can’t think of any worse treatment than to bang them together to catch insects. Also, they’re an incredibly complex structure to use just for this purpose. And they would blow the insect out of the way. Birds couldn’t clap their limbs together in front anyway—they just don’t have that kind of a shoulder. Is there any evidence for either theory? Not the slightest—and the people who take each view make that point. There are no examples of living or fossil scales that even remotely resemble a feather. 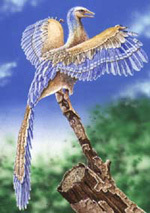 Archaeopteryx has complete feathers like modern birds. So how would you sum up your opinion? The theory of the evolution of flight is not about the birds, so much as it’s a theory ‘for the birds’. Grow from follicles which are tubular down-growths from the epidermis of the skin. Specialized growth matrix at the base of the follicle which is solely responsible for growth in length. Growth matrix part of follicle is the only permanent part of the follicle. Dermal papilla at the base of the follicle. Nutrient foramen at the base of the follicle where blood vessels enter to supply nutrition. Surface of the shaft is a hard keratinized structure while the centre (medulla) is comprised of vacuolated chambers. Follicles and their shafts are oriented at critical angles established early in their development. Growing cylindrical shaft slides out of the tube-like follicle. Follicle extends deep into the hypodermis. Follicle associated with sensory nerves. Muscles associated with the follicle provide movement and orientation of the shaft. Shafts vary with the stage of development showing, for example, different structure and colouration in the neonate, juvenile and adult. Shafts shed or mould seasonally resulting in changes in structure and colour. Sexual dimorphism of shafts under endocrine control. Growth cycle with a growing and resting stage. The growth cycle can be initiated at any time by plucking the shaft from the follicle. In the growth cycle, the old shaft is ejected by the growth of a new one. Exocrine function of follicle and shaft.